Many of our best family ski trips have brought serious adrenaline alpine adventures: skiing, zip lining at Gunstock, the mountain coaster at Okemo, dog sledding, riding in snow cat grooming machine, cat skiing and heli-skiing all make our top 10 list. Make room for rodeling – a wild sled ride that descends 7.5 kilometer down a ski resort, reaching speeds of 50 mph. La Luge at Le Massif Ski Resort in Quebec is a 7.5 km sled run, the 3rd longest sled run in the world and the only dedicated track in North America. It’s not for the timid, and takes about two hours during the ski day (for kids 12 and up). The term Rodeling comes from the authentic European style alpine wooden sleds with runners – rodel. What’s wild about this alpine sledding activity is its on a natural snow trail descending the ski resort’s full vertical, 2,483′ and 23,960′ long. See Le Massif Photos. Your crazy Canadian adventure beings by meeting your two luge guides, one of which is a ski patrol, at the summit of Le Massif ski area, near ski school, where you gear up with a helmet and heavy boots if you don’t have them. Wearing your ski attire, ski pants, jacket , gloves, goggles, etc is ideal as it can be a full contact snow sport. Now for sled selection and the critical decision: feet or head first? The traditional wooden rodel sled is faster, and you to sit up and steer with your upper body and feet, so that was an easy pick for me. The alternative hammerhead style sends you face first on your stomach dragging your feet for steering (and get more snow in your face I bet). Next you climb aboard a snowcat for the ride up Mont à Liguori where safety tips and steering instructions are given. Its counter intuitive, and crazy that you steer by leaning where you don’t want to go. You use your feet for braking and steering and emergency stops – though you are advised on how to do that properly so you don’t break an ankle, yikes. After a few practice passes on a 100 foot pitch, the guides declare “on y vas” and off we go like a 20 pack of crazy Canuks. In no time, my husband flies off the side of the trail and lands in a snowy spot- big smile on his face, so I continue on my bumpy squirrely sled trying to keep pace but also space between myself and other sledders in front of me. You get going fast quickly and steering is tricky. Leaning toward the fence or the tree you don’t want to hit doesn’t come naturally. Watching the sledders bob and weave and occasionally crash in front of me is exciting, scary and hilarious, as I grip my ride, speeding and skidding my way down the groomed track. Two tight turns, lined by bright red netting, prove too much for a few ahead of me and they get tangled up, but I manage to slip through scattered sleds and bodies – it’s a bit like Survivor sledding. After a long 4 kilometers ride, we stop at a log cabin for libation and a rest, a look at moose tracks, and many laughs about various mishaps on the mountain thus far. Then it is back on our sleighs for the fastest descent of the course, also the most scenic as you get closer to sea level and the magnificent St Lawrence River. Crazy hairpin turns sideline a few more sledders, they eject from their sleds like popcorn, but no one is hurt, they jump back on and hustle to get back into the race, so it is quite humorous. Arriving at the trails end, it’s all smiles, as we head for the gondola, meshing with skiers now for our ride back up Le massif. 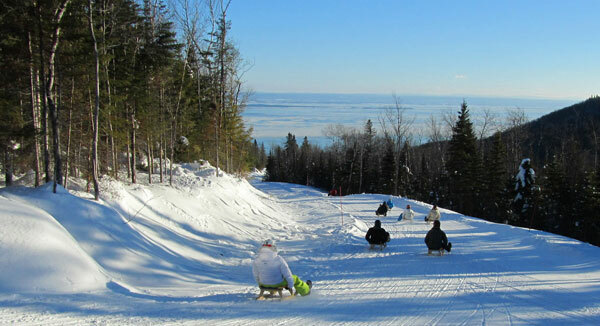 This crazy sled ride probably wouldn’t fly in the US, so go to Le Massif and give rodeling a try! It’s a lot of fun for $35. Kids 12 and over can participate.